HANNOVER, GERMANY: Hannover was one of the hardest hit cities during WWII. The city was left with only few historic landmarks after the war. It’s not a typical European city with pretty centuries-old buildings. Hannover has an energetic and thriving city center. The city is very modern and a good place for shopping or spend a day. If you like to get to know Hannover on your own, there is a Red Thread – your personal tour guide. 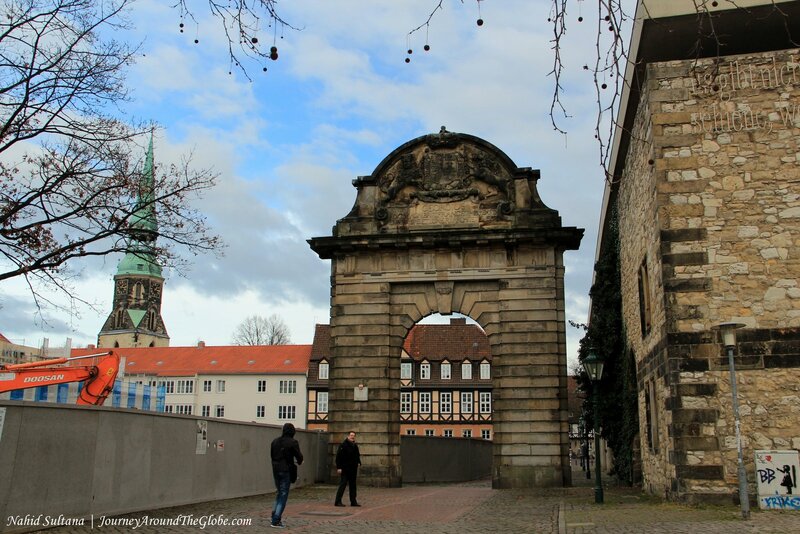 It’s a 4,200 meter long line on the sidewalk by the City of Hannover and leads you to the architectural, historical, and entertaining attractions. Accompanying literature and map can be obtained from the Tourist Information Hannover. We followed this Red Thread to discover Hannover…it was simple and doable on foot. It touches all the main spots of this city. OUR HOTEL: This hotel we stayed in Hannover, Novotel, was a little far from the city center. We walked at least 20 minutes to get to the heart of Hannover. The walking was nice because we went through some local shops, passed few streets, and saw other parts of the city. Novotel is a popular hotel chain in Europe (not sure about other continents). They didn’t have breakfast but had free Wi-Fi. The best part was that there was an awesome Italian restaurant only a block away from our hotel where we had dinner twice. EATING and SHOPPING: Kropcke and its surrounding areas are probably the best place to have meal in Hannover. It’s a crowded place with tons of choices to eat. You can get from street food to luxurious and fancy restaurants all in this pedestrian zone. Again whole city center of Hannover is a marvelous place for shopping with many including some upscale brand stores and local boutique stores. Take a stroll through the elegant street of Georgestrasse, the top shopping destination for fine clothes and accessories. 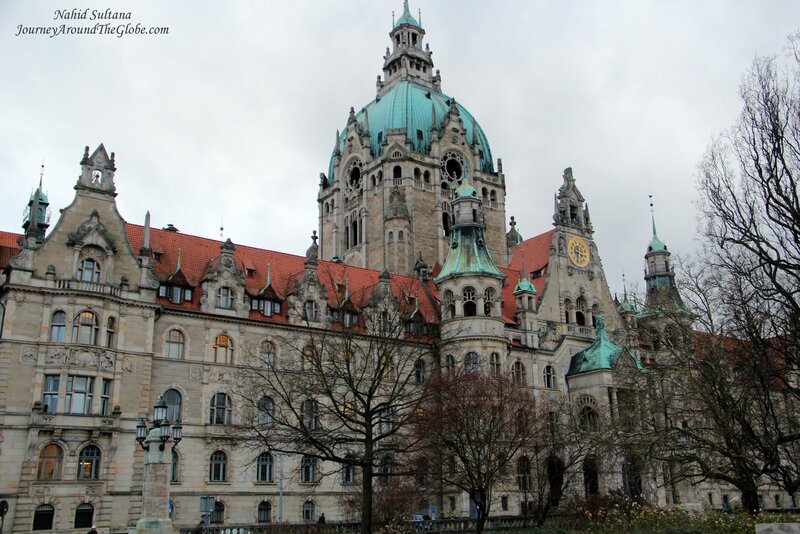 PLACES WE’VE VISITED: We had a whole day to spend in Hannover. 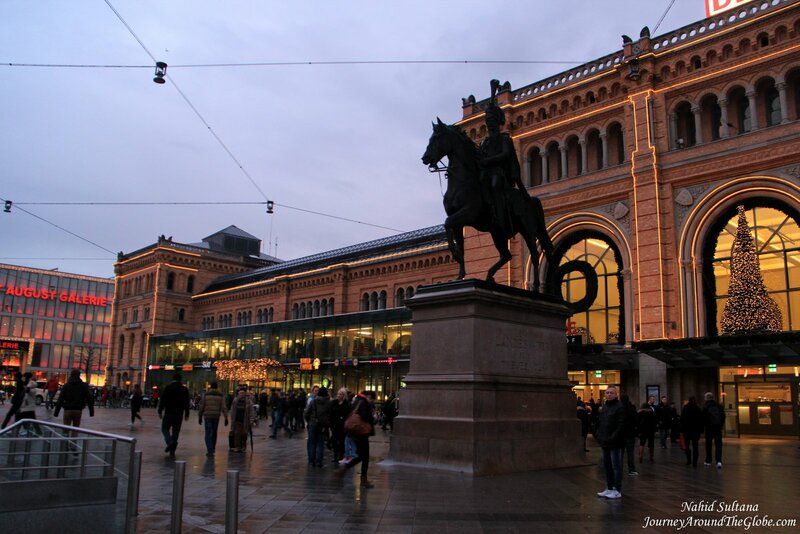 Other than the following places, Hannover’s main train station, Hauptbahnof is something to take a look at. It was built in 1879 and is known as Germany’s finest station. But wait, it’s not just any other train stations, it’s an outstanding shopping arcade too with lots of restaurants and snack-bars. We were there to take a short-ride back to our hotel from the city center at night…and it looked gorgeous with all the Christmas lighting. Hannover also has lots of museums, like Hannover State Museum, Historic Museum, as well as many modern architecture to please your eyes. 1) KROPCKE: This is the historic city center and a meeting point for both young and old. This large pedestrian area in the heart of Hannover is a major shopping spot. You won’t have hard time choosing a restaurant here because there are tons of them. 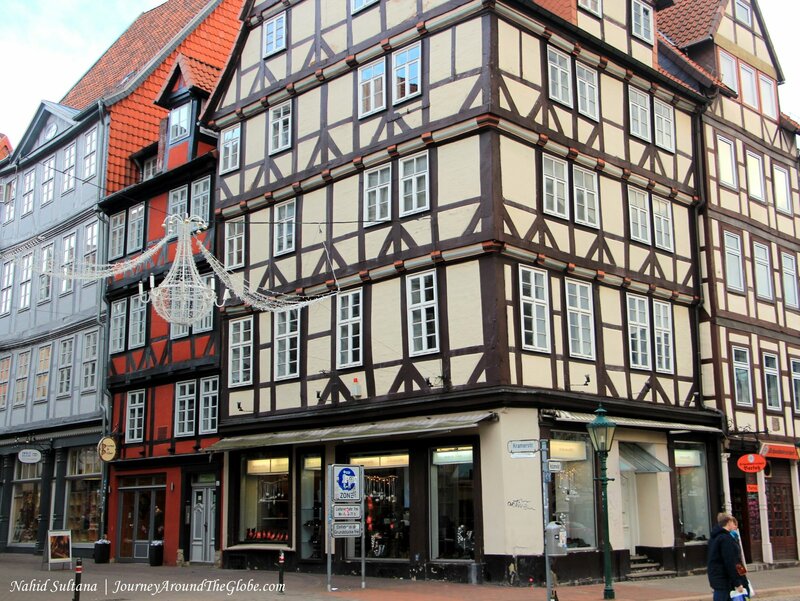 2) OLD TOWN or ALSTADT: This is a delightful area with numerous half-timbered houses and romantic spots. 3) MARKET CHURCH: Built in 1359, this is a splendid example of German Brick Gothic style. It is an old building with simple altar and simple decorations. The organ looked newer compared to the other items in the church. 4) LEINE CASTLE: We passed by this old castle in the middle of the city. Don’t really know much of the history behind it. River Leine cuts thru the city here in front of this castle. It was in our Red Thread guide, but didn’t go inside. 5) MUSEUM AUGUST KESTNER: The museum is named after August Kestner (1777 – 1853) who collected a considerable number of Egyptian and Greco-Roman craftwork as well as other art objects. 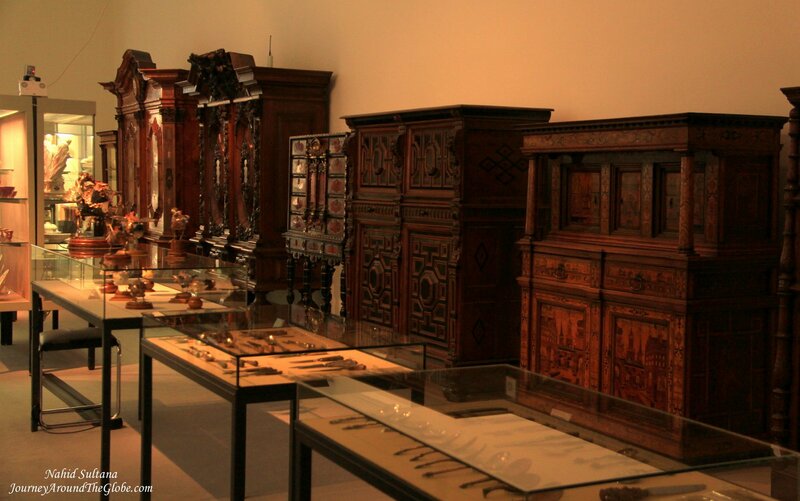 His nephew inherited the collection with the proviso that it has to be presented to his native City of Hannover. This is an interesting and one of a kind museum. Don’t miss collections from Egypt, as well as exhibits from the classical antiquity, history of design, and Coin Cabinet. Loved its antique and contemporary collections of artistic objects. There is a cafeteria and a shop inside the museum. It has three levels and took us about little more than an hour to look around. It’s located beside New Town Hall of Hannover. Visitors can enter free on every Friday. 6) NEW CITY HALL: This is one attractive building in this city from the early 1900s. With a striking domed tower, this is a magnificent edifice dating from the Wilhelminian period. Inside the city hall is as beautiful as its front façade. We only stayed there for few minutes. Other than the building itself, something to see here is the different phases and faces of Hannover throughout its history. Miniature model city depictions show Hannover in the middle age, before and after WWII, and present time (1689, 1939, 1945, and 2000). 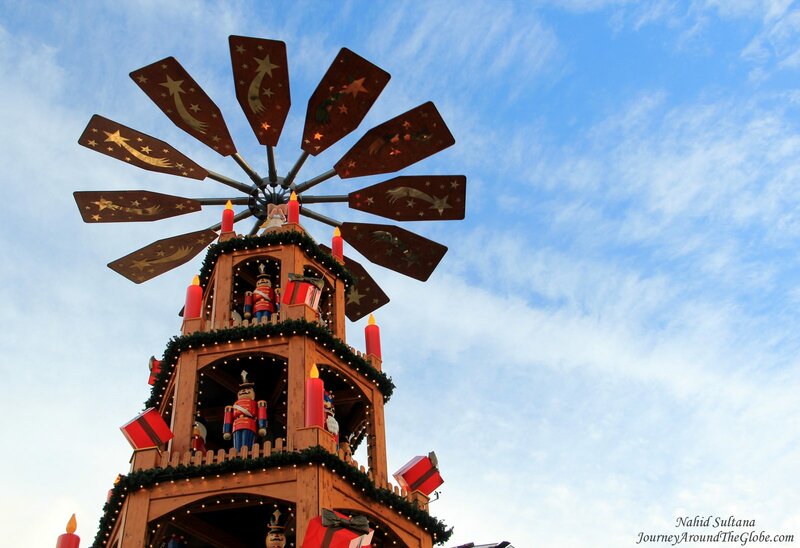 You can see how Hannover got its present look…it’s fascinating. We didn’t take any tour here, although it’s available. There is no fee just to go in and check out its interior. You can visit its dome for a panoramic view with a little fee. 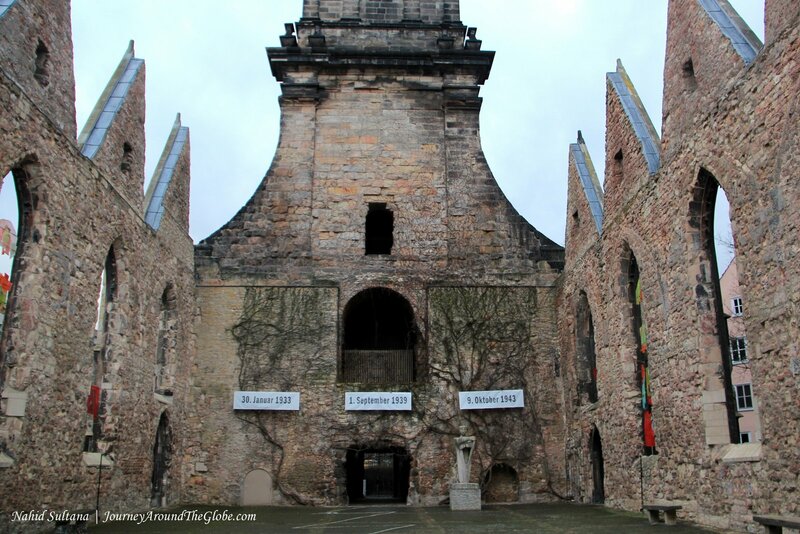 7) AEGIDIEN CHURCH: This is a 14th century church which was destroyed in WWII. They didn’t reconstruct this church and kept it as a memorial to the victims of war. There is a Hiroshima Peace Bell near where the old altar used to be. Only the skeleton of this church still stands to remind us all the damages a war can do. 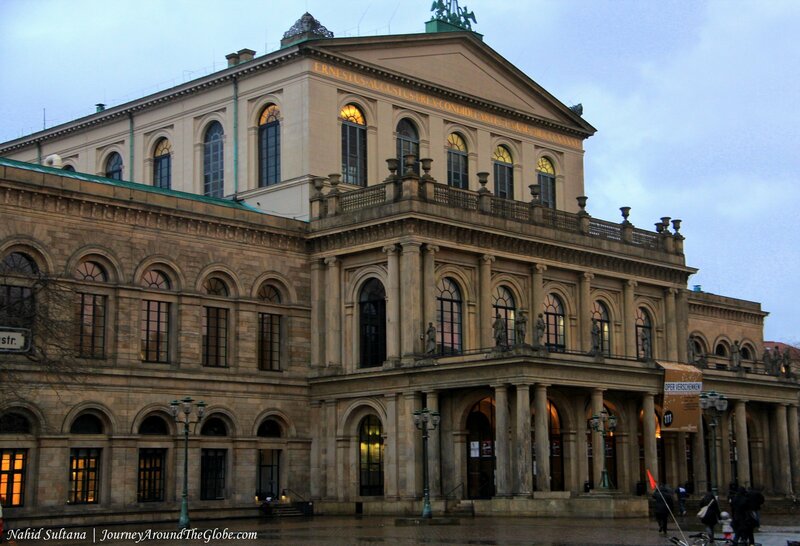 8) HANNOVER OPERA: This is another fantastic architecture of Hannover. It was built in 1852 and was ranked by the opera guide published in London as one of the ten best in the world.